As mentioned earlier, the simple square oceans driven by simple wind fields, envisaged by Sverdrup, Stommel and Munk (Figures 4.10, 4.13 and 4.14) are representations or models of the real ocean. They are not attempts to replicate the real ocean in all its complexity, but experimental mathematical constructs intended to reveal the fundamental factors that determine the pattern of the global ocean circulation. Furthermore, the imaginary oceans they represent are essentially two dimensional, and have no bottom topography. With the advent of powerful computers in the 1970s, it became possible to model more complex imaginary oceans (or parts of oceans) by dividing the volume occupied by water into 'boxes' by a grid. The rate of change of flow through the sides of each box may be calculated using the equations of motion (Equation 4.3), then calculated again on the basis of the results of the first calculation, and so on, the repeated recalculations following the evolution of the flow over time. For a very simple situation, such as flow through a channel where the water is assumed to be well mixed and therefore homogeneous, a one-dimensional model may be sufficient (Figure 4.17(a)); for more complex situations, two-dimensional and three-dimensional models may be needed (Figures 4.17(b) and 4.18). A three-dimensional model can take account of variations of flow with depth (i.e. not just depth-averaged flow) and can include the effect of the sea-bed (albeit relatively crudely). The choice of the model grid to be used (i.e. how the 'boxes' are defined) will depend on the problem being addressed and the computing power available. Figure 4.18 shows three types of grids that might be used, each of which has its own advantages and disadvantages. Whatever the type of grid used, the number of 'boxes' needed will increase with the complexity of the situation being investigated and the resolution (i.e. degree of detail) required; and the greater the number of boxes, the more powerful the computer needed to run the model. 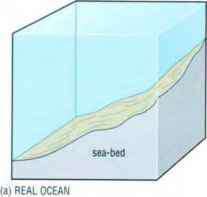 Coastlines and the sea-bed are fixed boundaries of any model of an ocean, or part of an ocean. Would the sea-surface he a fixed boundary? Not really. Models may be kept more simple by assuming that the sea-surface behaves as if a solid barrier is held against it (a so-called 'rigid lid'), but as you know, winds cause horizontal motion of surface water, so a 'rigid lid' is generally considered an unacceptable simplification. However, as most models are concerned with bulk movements resulting from ocean currents, the sea-surface is often assumed to be flat, because its ups and downs would average out over the duration of a model 'time-step'. At a horizontal sea-bed. vr must be zero. More generally (as the sea-bed might be sloping), the velocity perpendicular to the sea-bed must be zero. Models are driven or 'forced' by mathematically applying the effect of whatever is/are considered to be the principal driving force(s). The results are constrained by including in the model known, or assumed, values for one or more parameters - for example, in the simple case of flow through straits, it could be the total volume transport through the straits. If the aim of the exercise is to simulate the average situation - the 'mean flow' - the model is run until the flow pattern generated stops changing, i.e. has reached an equilibrium situation. The early models of Sverdrup, Stommel and Munk, discussed earlier, were driven simply by the frictional influence of wind stress on the sea-surface. Most modern three-dimensional models also include information about the transport of heat and salt, both into and out of the ocean, and within it. The importance of fluxes of heat and salt for the ocean circulation will be discussed in Chapter 6, but for now we should simply note that heat and salt are conservative properties, in that once a body of water has moved away from the sea-surface, its temperature. T, and salinity, S, can only be changed by mixing with another body of water with different T and S characteristics. This means that if we can assign initial values of T and S to each grid box, and feed in information about addition and removal of heat and salt and/or freshwater at the sea-surface, we can predict fluxes of heat and salt through the faces of the subsurface grid boxes by using equations for the conservation of heat and salt, similar in type to the continuity equation (4.3d) for the conservation of mass. In this way. we can produce a pattern for the transport of heat and salt around our model ocean, enabling us not only to model a more realistic density distribution, but also to tackle problems of environmental and climatic relevance. 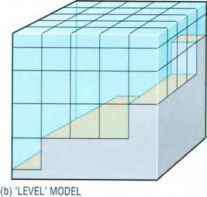 Figure 4.18 Schematic diagram to illustrate three types of grids used in three-dimensional models, (a) Section showing the bathymetry of the region being modelled. In (b) to (d) the horizontal coordinate system is represented by fine vertical lines, while the vertical coordinate system is indicated by fine horizontal, sloping or curved lines. 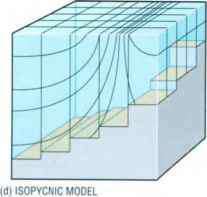 The most conventional system is (b), known as a 'level' model, because the vertical levels are fixed; in (c), the 'terrain-following' model, the heights of the boxes are a fixed proportion of the ocean depth; and in (d), known as an isopycnic model, the vertical coordinates are isopycnals. In each case, the equations relating to flow velocity are solved for points at the centres of the faces of the grid boxes (cf. Figure 4.17), while those relating to transport of heat and salt are solved for points in the centres of the grid boxes themselves. How close a modelled situation comes to reality can only be judged by how closely the flow patterns, flow speeds, and T and S distributions generated by the model resemble those actually observed (although, of course a realistic flow pattern could be generated by a modelled situation in which the effects of two or more incorrect assumptions have cancelled out). Paradoxically, insights into the processes really at work are sometimes provided by those parts of a modelled flow pattern that diverge most strongly from what is observed in reality. These may indicate that factors that were ignored (i.e. terms left out of the equations) because they were thought to be unimportant were, in fact, significant after all. 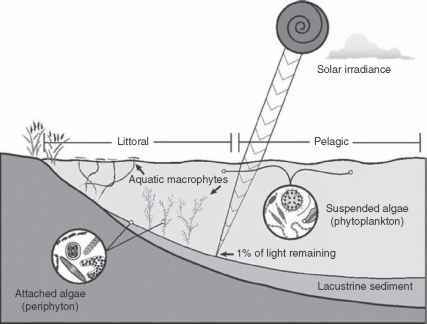 Stommel's modelling of the North Atlantic gyre (Figure 4.12) provides a clear example of this: the fact that the model (2). which included no variation of the Coriolis parameter with latitude, also showed no western intensification of the flow, strongly suggested that variation with latitude was the significant factor (which was, of course, confirmed by model (3)). Models like those of Stommel. Sverdrup and Munk. which omit unnecessary detail in order to reveal the fundamental processes at work, are known as process models. Another type of model includes as many factors as practicable, so as to be as realistic as possible. Such models are known as predictive models. Models are sometimes used to predict current patterns over a particular time period, under certain circumstances. For example, in 1988, oceanographic modellers at the Proudman Oceanographic Laboratory were asked by the British Olympic Sailing Team if they could predict racing conditions in the waters off Pusan in the Korea Strait (Figure 4.19(a)). Although current flow in the area is quite complex, the dominant features seem to be (1) strong tidal currents and (2) a mean flow to the north-east in the Tsushima Current, an offshoot of the Kuroshio (the equivalent of the Gulf Stream in the North Pacific). Because time was short, it was decided to construct a simple two-dimensional model, in which current flow (the Tsushima Current plus tidal currents) would, of necessity, be depth-averaged. This was considered to be an acceptable simplification, but resulted in local wind-driven currents being under-represented, because the flow was spread over the whole depth instead of confined to the surface Ekman layer. It was decided to compensate for this effect at the time of racing by adding a surface current of 3% of the wind speed (from local weather forecasts), at a small angle to the right of the wind (cf. Section 3.1). 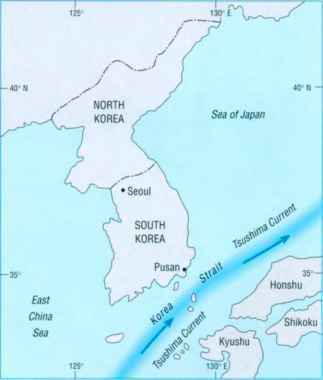 The aim was to predict the main features that were likely to occur in the race area off Pusan, particularly any effects of changes in the strength of the Tsushima Current. The model consisted of two parts. The first was a fine-scale model of the actual race area, with a resolution of 450 m (i.e. with grid boxes of 450 m x 450 m), sufficiently small to cope with the eddies generated off headlands and the sharp divergences of surface currents observed in the area. This was 'nested' within a coarser-scale model of the Strait of Korea, with a grid size of about 10 km, which was used to provide tidal conditions and mean flow consistent with available observations. The Tsushima Current was represented by 'inputting' a north-easterly gcosirophic Current (with appropriate sea-level slope) entering through (he southern and western sides of the model, and then ensuring that the same amount of water w as removed through the northern and eastern sides of the model. 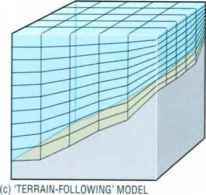 Interpolations of results front this coarse-scale model were used to force the fine-scale model along its open boundaries, and flow patterns within this smaller area were produced for different states of the tide and different strengths of the Tsushima Current. The models were generally successful. They reproduced many of the features actually observed, and provided useful extra information. In particular, they predicted that while the flow direction affecting race courses A. B and C changed w ith the tides, despite the influence of the Tsushima Current, the flow affecting course D was always towards the north-east (Figure 4,19(c)). The British Olympic Sailing team were pleased w ith their overall performance, which included winning a Gold Medal They were not (he only team to make use of computer modelling at the Seoul Olympics, and since then it has become routine.